A new initiative among some of the largest and most influential philanthropic foundations in the U.S. aims to shift the #MeToo lens to many of these underserved populations. 11 partners have agreed to fund campaigns against sexual violence and harassment that are helmed primarily by women of color and members of other vulnerable populations. Participating foundations include the NoVo Foundation, CBS, Nathan Cummings Foundation, Kapor Center, the Open Society Foundation, the Ford Foundation, the Conrad Hilton Foundation, and several others (including three anonymous donors). Rather than assuming marginalized women are voiceless, funders in this new team effort are hoping to amplify the voices of women leaders and survivors who are already working to secure a safer, brighter future for themselves and others. Freada Kapor Klein, Co-chair of the Kapor Center, agreed, saying: “What’s different about this fund is that it’s driven by believing in and supporting solutions that come from the lived experiences of the most marginalized women. Women of color face staggeringly disproportionate levels of bias and harassment that limit their access, opportunities and outcomes to full participation in their workplaces and society.” Inspired by organizing efforts through groups like the Restaurant Opportunities Center and the National Domestic Workers Alliance, this fund is survivor-led at its heart, rooted in the belief that systemic change can only come about when it’s headed by people working with and for their own communities. The transnational funding efforts, which start with $20 million and are being housed at Rockefeller Philanthropy Advisors, will focus not only on domestic laborers and other industries where women are frequently subjected to sexual harassment (such as the garment industry), but also on sexual abuse in institutions such as medical facilities, prisons, jails, and schools. The fund names its five primary goals as: policy advocacy, narrative and culture change, organizing and civic engagement, leadership development, and convening and peer learning. 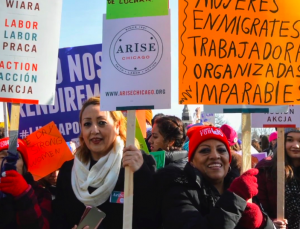 Funding will go towards existing and burgeoning organizing efforts at every level, as well as efforts to effect public policy changes to provide more labor protections against sexual violence. The fund will also focus on launching a communications hub centered around eradicating sexual violence against marginalized women, supporting artmaking and educational projects alike in order to “change the narrative” about sexual harassment. Beginning in 2019, at least $5 million will be provided in grants each year to projects that align with the fund’s mission. The team of donors has made a five-year philanthropic commitment to start. Donors who are curious about the initiative or who want to get involved can find more information at The Collaborative Fund for Women’s Safety and Dignity.